These blankets and pillows might remind you of the popular quiet books, but they are much more inviting! Each panel has a puzzle or game to complete. For instance, one panel may have a caterpillar with string legs that you can practice tying. Another panel might offer tactile shapes to play a matching game. It would be a lot of fun for kids with visual impairments to practice fine motor and independence skills, plus all the materials are multi-sensory. We have the caterpillar pillow and Ivan just loves it. 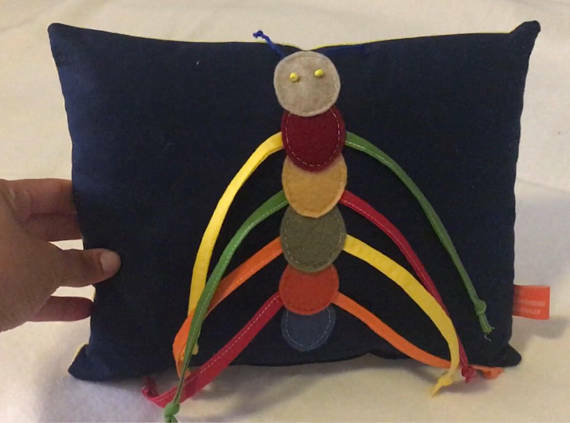 The pillow is soft and the caterpillar legs are fun to find, pull, tie, untie or sometimes just chew on (a little). 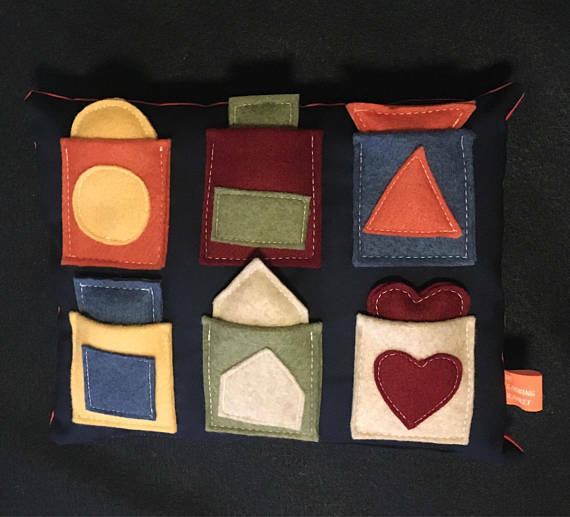 This is actually one of our go-to toys to bring with us on long doctor’s appointments or hospital stays.